What is it about OC that makes it that much more awesome than LA? It may be an hour plus drive for me to get to Orange County, but new, exciting restaurants like The Recess Room make it all worth it! I've been looking forward to their opening for some time now. 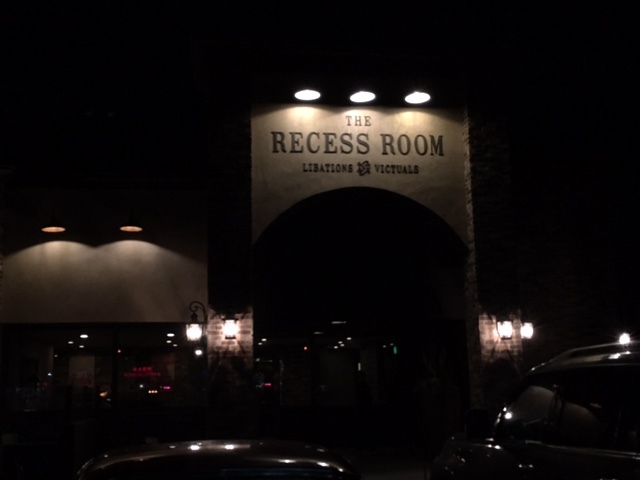 Here's a little background on them: The Recess Room started when 5 boys who became friends during a game of handball during school recess on a Fountain Valley playground. The lifelong friends dreamed of opening a restaurant together where they could share delicious food, good drinks and reminisce about good times, hence The Recess Room was born. The Recess Room serves modern American tapas-style cuisine, locally focused craft beers, handcrafted cocktails and a serious fun, rustic, old-school design. The restaurant’s old school style was designed by Kenneth Ussenko Design, the brains behind The District, Crustacean San Francisco, The Farmhouse at Roger’s Gardens, etc. And let me tell you...the place is plain cool. I wondered aloud why MTV wasn't filming an updated episode of 'The Hills' while I was eating. The people were gorgeous. The venue was hip and the food was amazing. If you need a statement dish, the Kurobuta Pork Head from Recess Room feeds 5 or more. That's one way to get people talking and grubbing! How great is this? The Octopus Salad with frisee, roasted potato, watermelon radish, chorizo, chimichurri, kalamata aioli was amazing. It was my favorite dish. Octopus is hard to cook just right and this dish was divine. I know this photo looks like it could be bananas, but it's actually bone marrow mac n cheese. This was another favorite dish of mine for the night! I was most surprised by our server's Blue Crab Beignet reccomendation. I think if I had to list my favorite dishes in order it would be a tie between this and the octopus salad. I also ordered the Wagyu Tartar, which was ribeye, roast chili flake, tamarind, cilantro, shallots, lime, all on a tasty and crispy taro chip. Although I did enjoy this, I would have liked the tartar to be ground up a bit more for texture. The Veal Dumpling had tomato, garlic, shallot, marsala wine, creme fraiche, parmesan. I was so full after eating these. For dessert, I ordered the Fluffer Nutter, which was basically a deep fried PB&J. It had chunky peanut butter, marshmallow fluff, banana, vanilla ice cream. Such a tasty mix of savory and sweet! When I arrived for the grand opening of The Recess Room, they didn't have their alcohol license ready yet, so I was able to try the drinks as a cocktail. This gorgeous Gatsby Mule with hand crafted ginger beer, sage infused blueberry cordial, lime was my favorite. Can't wait to go back and try it again with alcohol. What is really exciting about the drink menu is that the cocktails use locally sourced and homegrown ingredients from their on-site herb garden. Food was amazing. I can't wait to go back. There's a bunch of dishes I was too full to try. I will most definitely be stopping by when I'm in OC!